Background Internationally, the use of dietary supplements has been growing rapidly. Patient support for pharmacist sales of nutritional and dietary supplements is also strong. The increase in demand for nutritional and dietary supplements and subsequent advice about these products, however, makes it necessary that pharmacists maintain a contemporary knowledge of the area. 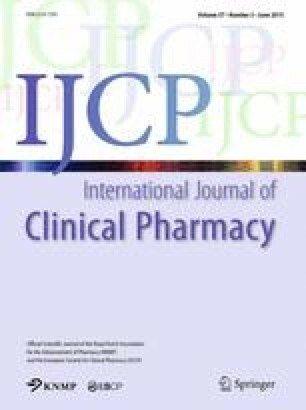 Aim of review This systematic review was conducted to examine the current evidence regarding the level of the nutritional and dietary supplement knowledge of community pharmacists and their understanding of their therapeutic effects. Method Electronic databases including Medline, Scopus, Embase, CINAHL, Scifinder and the Cochrane Controlled Trials Register were searched. Studies assessing nutritional knowledge of pharmacists in community pharmacies were eligible for inclusion. All languages and study designs were considered. Study results were analysed and pharmacist knowledge scores were given out of 100 %. Results From 5594 studies identified, nine met the inclusion criteria. Each study tested pharmacist knowledge with predetermined questions calculating results as the number of questions answered correctly. These knowledge scores were converted to a percentage score for the purpose of this paper. The median knowledge score across all papers was 64 %. A lack of studies assessing community pharmacists’ knowledge of commonly sold vitamins and minerals was observed. Conclusions Global community pharmacist knowledge of dietary supplements appears to be poor. Community pharmacists have an professional responsibility to provide accurate health information about dietary supplements as they do for any other therapies they provide to patients. Further research including that which assesses pharmacists’ therapeutic knowledge of commonly sold vitamins and minerals is suggested. An erratum to this article is available at http://dx.doi.org/10.1007/s11096-016-0422-2. This research received no support from any funding agency in the public, commercial, or not-for-profit sectors. The authors of this Research Paper declare no conflict of interest.